The J-Mount from the front. The barrel section can accommodate larger eyepieces to allow for a secure fit, while the ribs on the inside of the barrel maintain proper Z-distance. Shims (not pictured) can adjust the Z-distance for those with thin or no case on their smartphone. Additionally, the J-Mount can be customized with a logo on the movable Y-adjustable platform. Please contact us if interested in device customization. A view from the rear of the J-Mount highlights the adjustment apparatus for the Y-axis. A view from the top of the J-Mount highlights the cantilever platform (to the left of the eyepiece barrel) that maintains a horizontal orientation when the mount is placed on the left eyepiece. 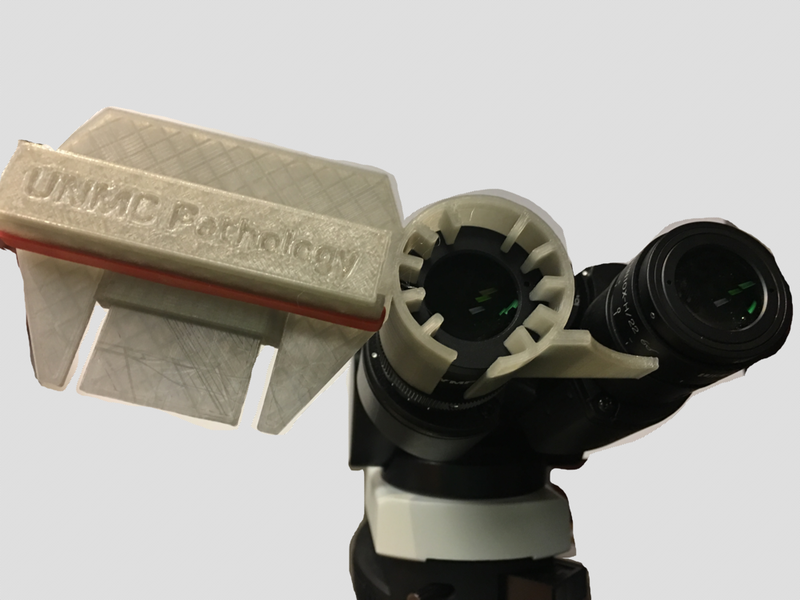 The cut-out in the platform allows the user to still view the microscopy field with the mount still in place. The J-Mount was developed to hold a smartphone in landscape orientation up to a microscope eyepiece. With any mount, there are 6-axes of movement to consider: X-axis, Y-axis, Z-axis, as well as pitch, roll and yaw. The eyepiece barrel is designed to wrap around the outside of an eyepiece, taking care of the later 3 axes of movement. The ribs within the eyepiece barrel hold the mount at the necessary Z-distance from the eyepiece lens to enable positioning in the correct focal plane. Two adapters are included that act as 'shims'; for those with thick cases, no shims are necessary, for those with a thin case, a thin shim can be used, and for those without cases, the thicker shim works best. The pins of the shims wrap around the ribs within the eyepiece, staying securely in place once positioned. For Y-axis adjustment, a thumbscrew on the rear of the mount adjusts the phone shelf up and down; again, once the mount has been set for your phone, no further major adjustment is needed. Lastly, for the X-axis, the phone is slid along the platform to place the camera in the optimal position. The J-mount comes in 2 sizing varieties in order to fit most microscopes and smartphones. For those with modern professional grade microscopes produced by Nikon and Olympus, an eyepiece size of 3.6 cm is best. For those with microscopes which have smaller diameter eyepieces, the 2.6-3.6 cm eyepiece will work best. Additonally, it is best to remove any rubber protectors on the eyepiece to allow easy setup and removal of the J-Mount. As currently designed, the J-Mount is designed to attach to the left eyepiece.